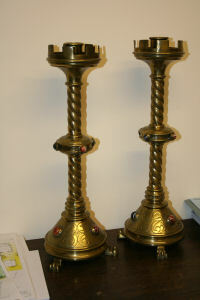 A very good pair of reformed Gothic Revival candleholders with castelled drip pans, twister stems, circular bases and standing on claw feet. The bases and central knobs embellished with semi-precious gemstones and the whole engraved with typical period motifs. Attributed to Jones & Willis circa 1860. Provenance: Countess of Powell & Duffryn (a member of the Guiness family).